Bill Lisgo, our pipe major, joined the Band in 1960. He has been a Band member ever since. A virtuoso piper, he was tasked from a very early age with teaching elementary piping classes, under Terry Dowling's supervision. Over the years, the name Bill Lisgo has become indissociable from that of the Fianna Phádraig Pipe Band. Since taking over as pipe major in the mid-90s, he has worked tirelessly to ensure that his beloved pipe band survived what turned out to be a very difficult period in its history, with members moving away from the city or leaving the Band due to professional or family commitments, and youngsters choosing the more immediate satisfaction of modern day pastimes over the longer - but, believe me, infinitely more gratifying - apprenticeship of the pipes and drums. It would be no exaggeration to say that the Band's current good fortunes, with many former members returning to the fold and several youngsters learning the pipes and drums, are in no small way attributable to Bill's charisma and determination. Bill at Sunday band practice. Ken at Sunday band practice. Ken first joined the Band in 1958, playing alongside such legendary Band figures as Mike Barker, Peter Hussey and Jimmy Hickey. Work and family commitments took him away from the Band in the early seventies, but since coming back in 1991, after Terry passed away, Ken has been a pillar of the Band, sparing no efforts to organise his drum corps, often turning out as the sole drummer, and sometimes with assistance from other drummers, such as Mike Coffey and John Fitzmaurice (before John's final return to the Band in 2012). Although he will not thank us for saying this, Ken is very much our link to the Band of times gone by. The figures he played with back in 1958 are unknown to some, just names to others and distant memories to others still. His knowledge of the Band's history has been of invaluable help in putting together the history of the Band for this website. 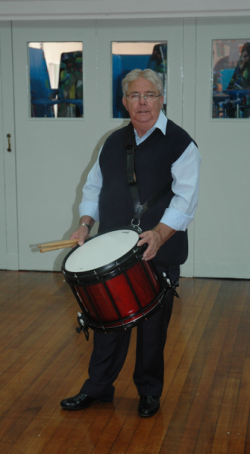 As well as turning out with the Band, Ken is now teaching youngsters to play the side drum and the pride he clearly takes in this role is a joy to see! Dominic joined the Band in September 1973. He has been a Band member ever since. His devotion to the Band and its members is second to none. On many an occasion, when Jim's health was failing, Dominic would phone to say hello and ask how he was. Dominic was also very close to Terry. Although greatly saddened by his loss, he decided that the best tribute he could pay to his late friend and pipe major was to continue playing in the Band and make sure that the Big Fella's legacy was not lost. Dominic is very proud of the Band, but the Band are even prouder of Dominic. Dominic at Sunday band practice. 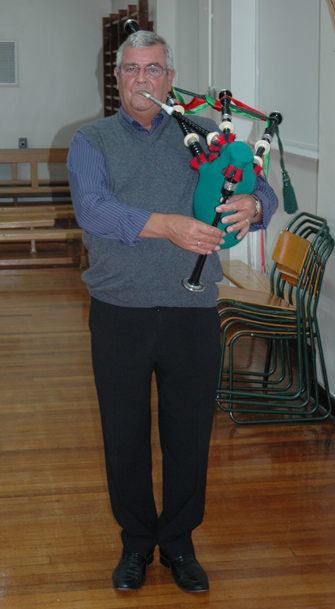 John first joined the Band in 1960, receiving lessons on the pipes from Terry Dowling, alongside Bill. 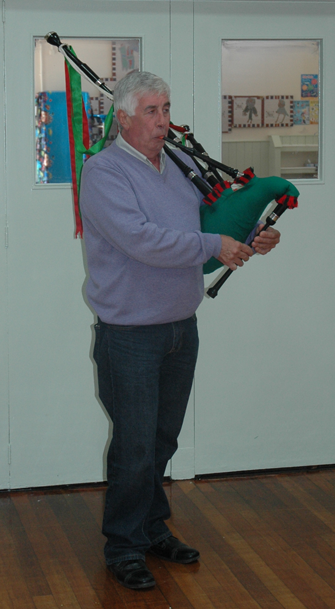 A highly experienced piper, he is often called upon to tutor individual learners in one-to-one sessions, in addition to the main lessons provided by Bill. Like many other families from the parish, the Hyland family are a "band family". 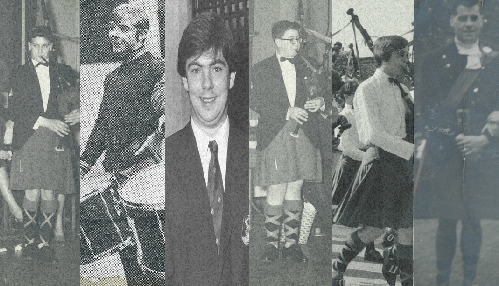 John, the first to join, was followed several years later by his sadly missed brother, Chris, who played the tenor drum, and then by his youngest brother Vin, who played the pipes. As Band treasurer, John takes part in the daily management of the Band's affairs, alongside Bill and Peter, and as one of our longest-standing members, his input on all matters concerning the Band is sought and appreciated. Peter first joined the Band in 1962. Throughout his career in the Band, he has always been a role model for his younger colleagues, setting an example for them to follow. 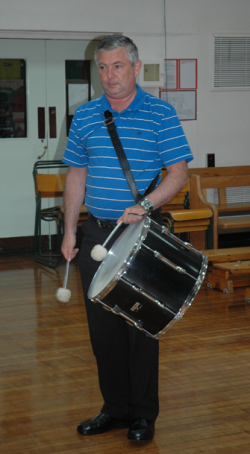 Since the mid-nineties, Peter has formed a tandem with Bill, dedicated to safeguarding the Band's future, and promoting the Fianna Phádraig name throughout our community. An accomplished piper, his role is also that of mentor to the other pipers, who are always happy to receive his advice on a broad spectrum of issues, ranging from piping technique to marching band choreography. A keen business strategist, Peter is a prime mover in the Band's ongoing development plans and an influential force of proposal in all Band decisions. Finally, and above all, Peter is a true and loyal friend, upon whom we know we can always count. Peter at Sunday band practice. Jim first joined the Band in 1951 at St. John's, after serving his 3-year national service in the Royal Irish Fusiliers. During his time in the forces, in between parachuting into Egypt and keeping the peace in Palestine, he found the time to learn the pipes, and proudly wore the saffron kilt of the band now known as the Pipes and Drums of the Royal Irish Rangers. Alongside his great friend Terry Dowling, Jim was a devoted member of the Band throughout his adult life, except for a three-year absence from 1954 to 1957 when he once again answered his country's call, serving this time in the RAF Regiment. Jim played with the Band until his health declined in later years, but he remained a band member until the very end. Some of you may have only known him as an old man, some of you may have had the good fortune to know him as a young man, too. We are proud of both, the handsome young man who joined the Band back in 51, and the old man who showed that passion for an institution can last a lifetime! The photo shown at the top of the page was taken at his care home a few months before his death, when he proudly wore his uniform for a visit from Bill, Ken and Peter who had come to play a few tunes for him. 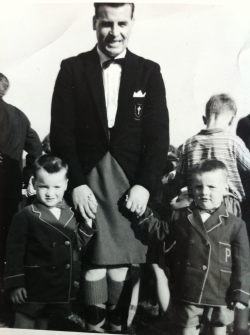 Jim with two future pipers.